One of the great and intractable myths of Hollywood is that the coming of sound destroyed, prematurely, many thriving careers that had been built in silent film. There were casualties among stars to be sure, brought about by adoption of sound by the American film industry. But the myth ignores the plain fact that one can look at any era and see careers crashing in waves, or simply fading away. Pick any year, in any era, and you’ll find multiple careers ending and new ones beginning. 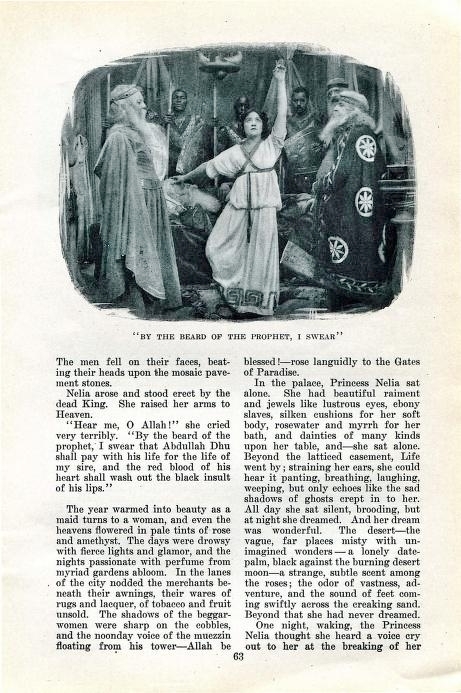 When movie fan magazines began appearing in the early 1910s, already among the articles about popular players were those of the “where are they now?” or “whatever happened to __ ?” genre. 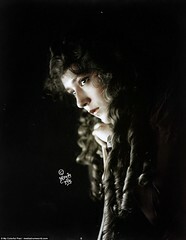 The first group of pioneering film actors with Griffith at Biograph, his first leading players of 1908-09, were all out of the business within five years of leaving Biograph. The one exception was Mary Pickford. And Pickford is the rare early star of film who was still among the top ranks of luminaries of the movies when sound did overwhelm the business and the art form at the end of the twenties. 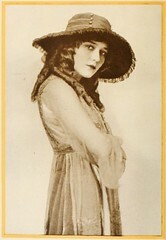 Mary Pickford was not without keen competition for superstardom in the middle of the 1910s. 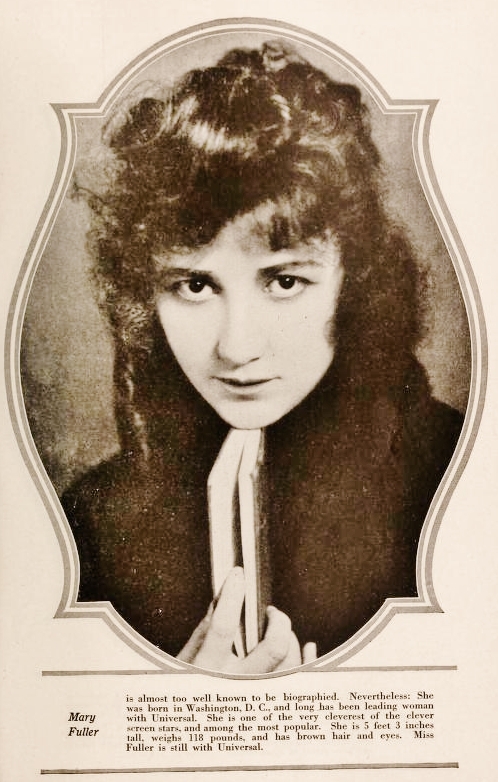 There was another Mary who, judging by the movie magazines and fan voting contests, was as popular as Pickford. And of all the tales of meteoric rises and spectacular crashes, none was as fast, as far, as harsh, violent and lethal to career and person as that of Mary Fuller. 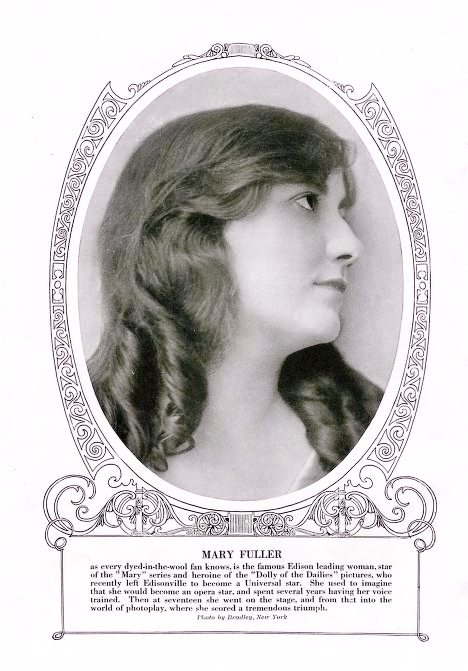 For a very brief period, from about 1912 to 1916, Mary Fuller was as popular as any film star. As much ink was expended describing her talent, looks, fashion sense and personality as that of the other Mary, Mary Pickford. 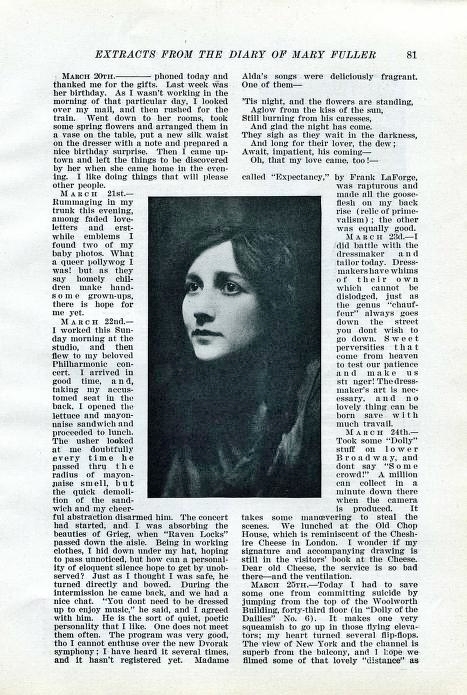 But by 1917, the film industry press was already asking, “What Happened to Mary?” It was a cute, convenient and journalistically lazy story line. Beginning her career on stage, by eighteen she was working in stock companies and it was during a period of inactivity, a seasonal “layoff” that all actors experienced, she decided to seek work in the movies. 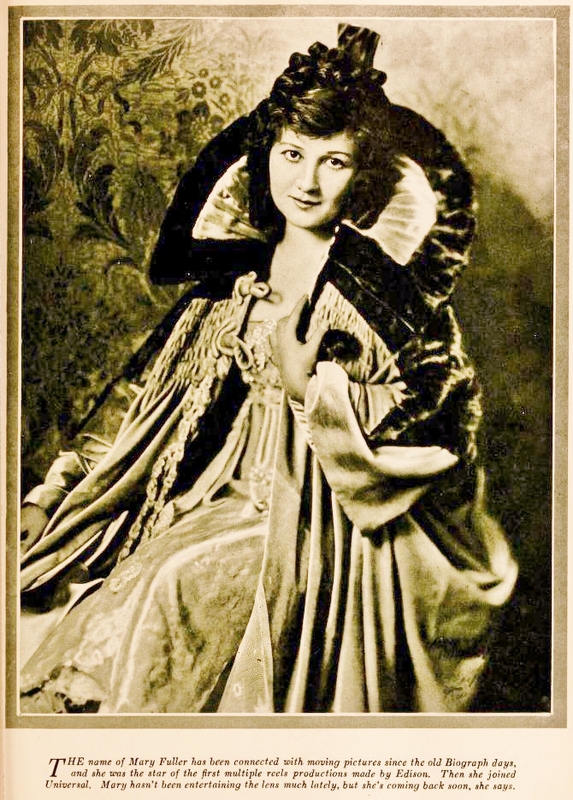 She was hired by Brooklyn-based Vitagraph, and made her first appearances in single reel dramas and comedies beginning in 1908. 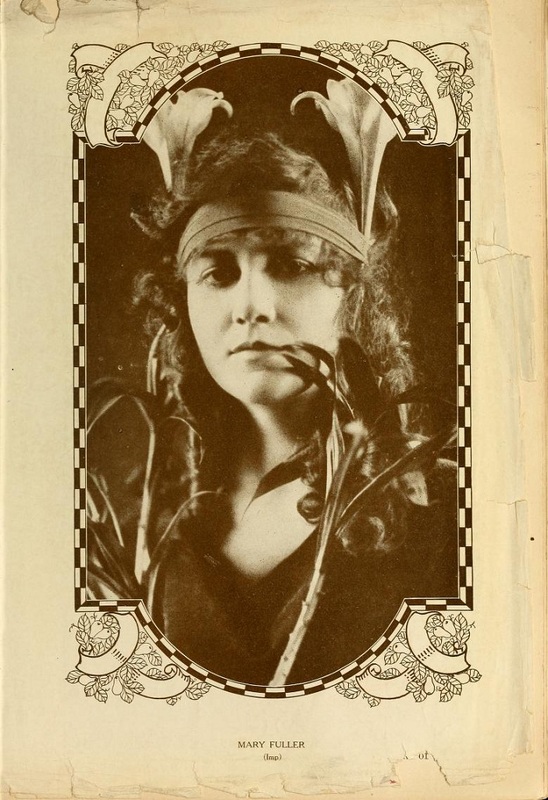 Within a year, she left Vitagraph and signed with Edison. She would spend the bulk of her career with Edison, making nearly 150 shorts plus dozens more serial episodes. 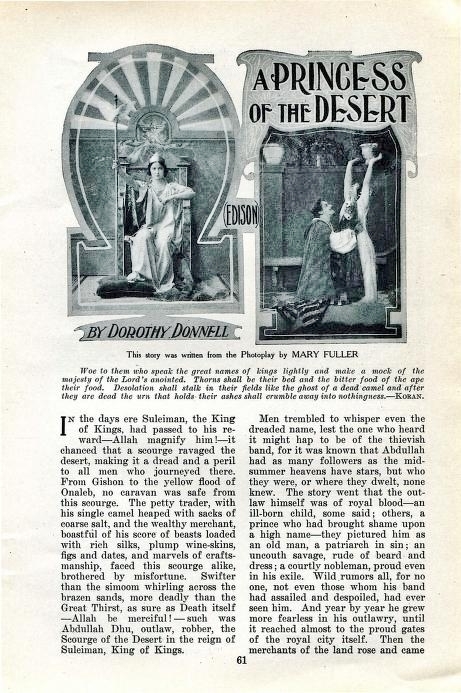 In 1912, Mary Fuller began starring in what was certainly one of the first episodic dramas in the movies that became known as “serials,” titled What Happened to Mary? with the Edison Company. 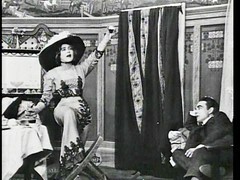 It was a huge success, both with the public and with critics, and spawned many imitators, including the better-remembered Perils of Pauline starring Pearl White. White is remembered because her career lasted a little longer and she was the subject of a later Hollywood biopic. Mary Fuller’s career and life ended badly — hardly the material for revival or remembrance in a 1940s American movie (which ignored White’s alcoholism and early death from cirrhosis). But Fuller was successful and a star almost from the dawn of narrative filmmaking, and among the most prolific actors of any era. 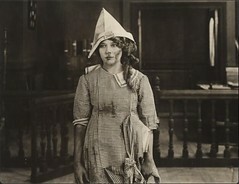 On the last Friday of each month from July 1912 to June 1913, the Edison Company released a single reel dramatic film, each a self-contained episode of a series, one of the first in what became a tremendously popular movie format, the serial. Rather than being a “cliffhanger” with each installment waiting for the next in order to resolve the drama, each episode of What Happened to Mary? was a self-contained single reel movie standing on its own, but with recurring characters and themes. The modern movie fan may have a hard time understanding the single reel drama of the silent film, but the dramatic series is an instantly recognizable form, having been a staple of our televised entertainment for over half a century. In mid-1914, Fuller left Edison to join Carl Laemmle’s Universal. After making more than fifty mostly short films for Universal, she joined Famous Players — a move that at the time seemed an upgrade. 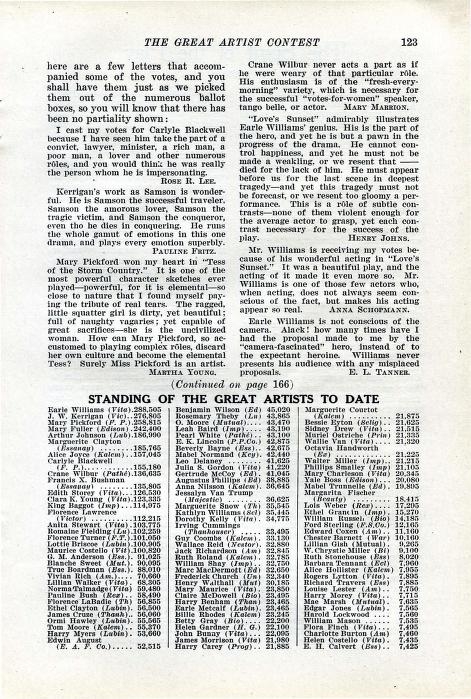 Famous Players was not a company that hired actors on the downside of their careers. But she made only one film for Famous Players, The Long Trail, a five reel feature that got mediocre reviews, at best. Fuller left the movies unexpectedly, without notice in 1917, reportedly “retiring” after allegedly making a great deal of money on stock market investments. When the press was able to track her down — she was at various times reported living in Pennsylvania, Virginia and 44th Street in Manhattan — she said she was on vacation, taking time off. I’ve seen nothing to indicate that her career was in serious decline, though some suggested the quality of recent Mary Fuller vehicles could be improved upon — they said the same of Mary Pickford during the exact same time period. 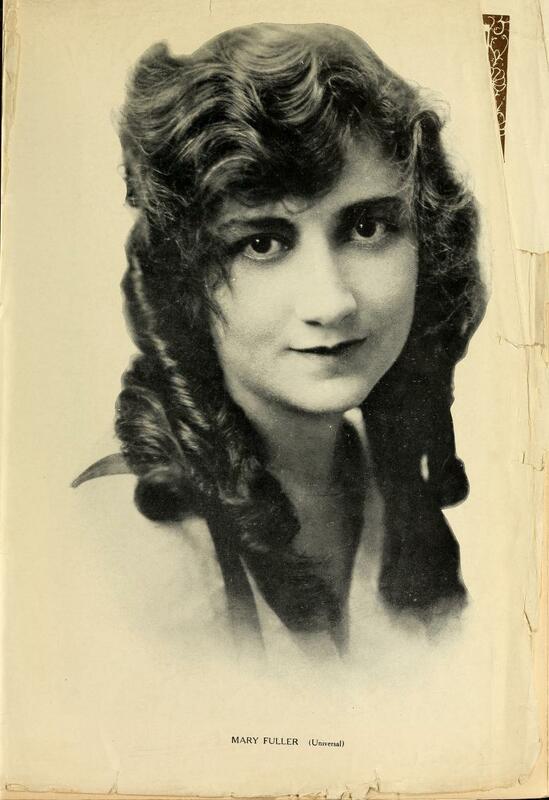 But Pickford took matters into her own hands with her own production company and autonomous distribution. 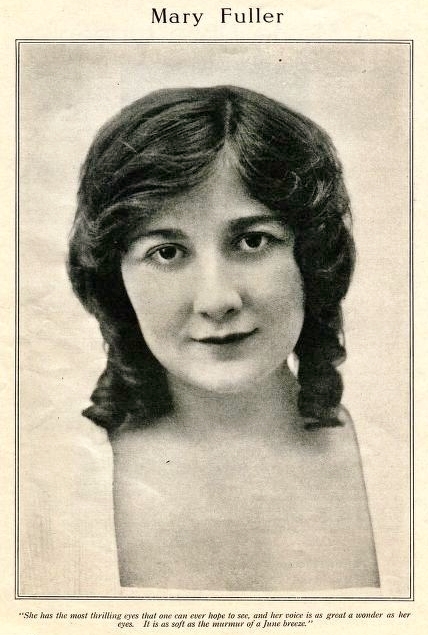 Fuller’s name was still appearing with regularity in the press, and as late as 1917, she was among the top ten to fifteen stars in the ubiquitous movie magazine fan polls (unscientific of course). In reality, she appears to have suffered from illness — magazines noted optimistically her drastic weight loss (they had earlier made fun of a weight gain by her and other popular stars) — but indications are it was mental illness. By 1918, she had literally disappeared from view. After one or two abortive attempts at comebacks, she spent the remainder of her rather long life living with her sister, who apparently acted as her caretaker, then was institutionalized until her death in 1973 at the age of 85. 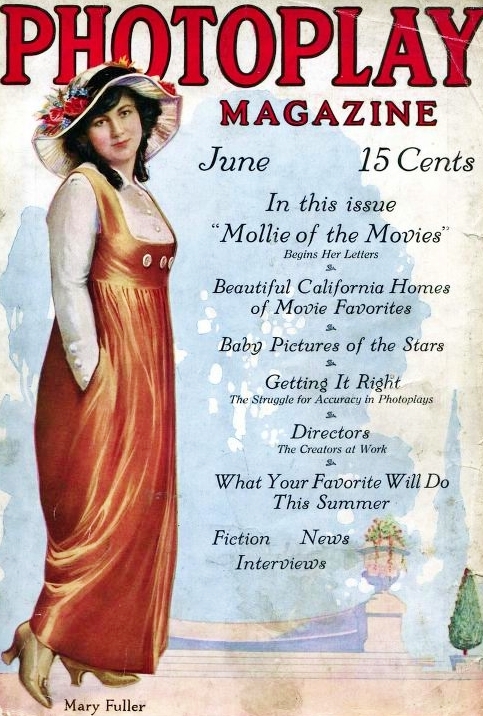 Once can hardly turn the page of a motion picture magazine of that era, the middle teens, without finding the name of Mary Fuller. 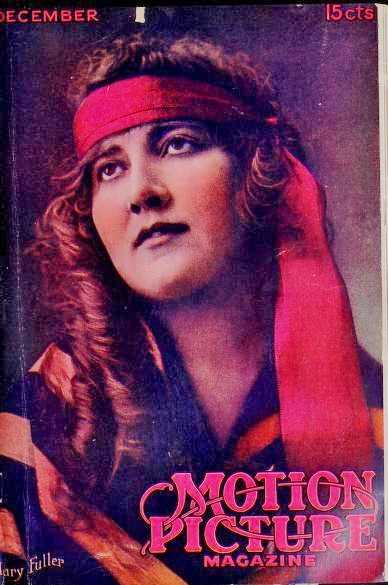 Articles about Fuller, extensive interviews, even articles written by Fuller can be found alongside many portraits, fashion layouts, advertisements for perfumes and lotions, and “candid” at-home photo-essays of her in Motion Picture Magazine or Photoplay, even in the industry-oriented publication The Moving Picture World. 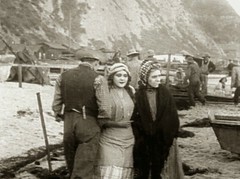 Below: Fuller also wrote scenarios for a number of her films, including A Princess of the Desert (1914) with frequent Edison co-star, Marc McDermott, and actor and future film director Harry Beaumont. Fortunately for us, we have access to much of this material online in the Media History Digital Library. It brings this otherwise obscure period to life. It was, rather than obscure, an incredibly vibrant period in film history, a period in which the American motion picture studios arose from a cottage industry. And it saw the development of the star system, of which Mary Fuller was one of the earliest and most visible exemplars. 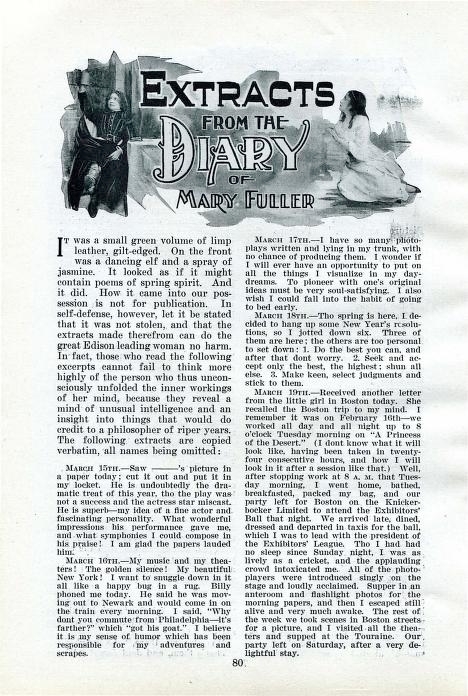 I haven’t attempted even a brief bio of Mary Fuller. 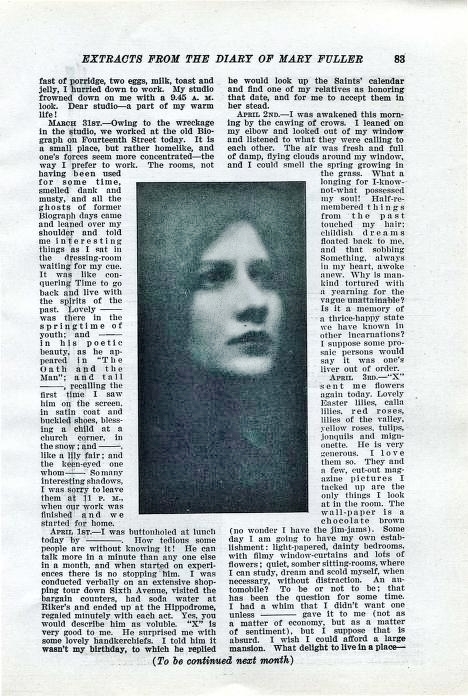 If you are interested in learning more about her, a good biographic sketch (as detailed as any I’ve found so far) by film historian Bob Birchard can be found here. Otherwise, you are left to your own resources. 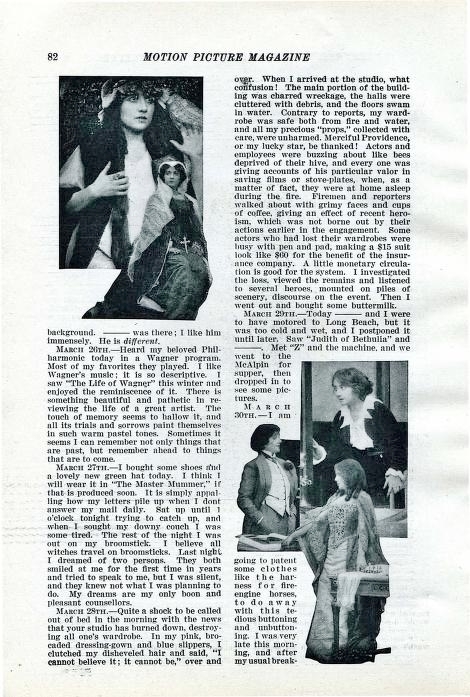 Gene, excellent article on Mary Fuller. I’m researching another “lost star” of about a decade later: John Bowers. He was successful as a second-tier leading man but he is remembered more for his suicide in 1936, that rightly or wrongly, has been credited as the inspiration for Norman Maine in A STAR IS BORN. But Bowers’ fate is just as mysterious as Fuller’s. He just did not tank in talkies as is the usual line about him – he stopped making films in 1927, a year or more before silent films ended. I have picked up a few clues over why his starring career ended well before silents did – it might make an interesting future story! Thanks Bob, I just took a quick peek at his filmography on IMDB, and it is rather impressive. He made two films with Mary Pickford at Famous Players, “Hulda from Holland” and “The Eternal Grind” (both 1916), plus “Ace of Hearts” with Lon Chaney, and starred with Blanche Sweet in “Quincy Adams Sawyer,” and those are just the ones I noticed with a quick glance. Of course his “bio” says his “career ended” with sound, which is basically a lazy way to interpret any career that ended somewhere between 1927 and 1934. I’m sure you’ll pin down the real story! Hurrah! Great tribute to Mary! Great article and tribute to Mary! Thanks for the great article on a forgotten star. Also, thanks for tackling the myth about the transition to sound and its effect on silent stars. Looking forward to reading more!